As part of the recent completion of the 15-year redevelopment at the National Museum of Scotland we refreshed two of our World Cultures galleries – Inspired by Nature and Artistic Legacies – which reopened to the public alongside our new Ancient Egypt, East Asia, and Ceramics galleries on 8 February 2019. One of the new additions to the Inspired by Nature gallery are four touch tables. 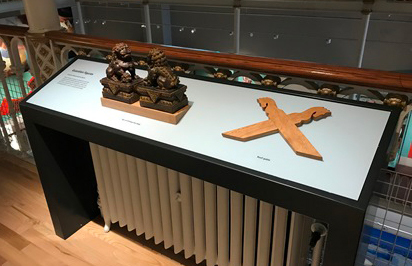 We commissioned some new pieces specifically for this, working with Scottish artists to create some fantastic touch objects which enhance the displays and themes within the gallery. For this theme, we commissioned Perthshire based stone artist David F. Wilson to carve three stone semi-spheres demonstrating the transformation from the raw material to the finished product. David chose to use Scottish basalt, exploiting the natural properties of the stone to create a striking surface pattern combining concave and convex shapes. The difference between the raw, tooled and polished surfaces of the stone makes these pieces great to touch. 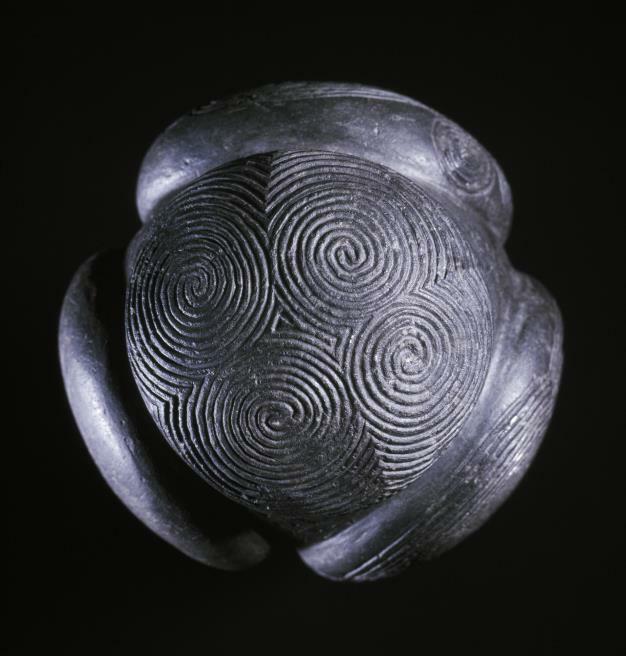 David situated his work within a tradition of carving stone spheres in Scotland, including the Neolithic carved stone balls of which National Museums Scotland has an excellent example on display – the Towie Ball. The Towie Ball, a carved stone ball was found in Aberdeenshire. 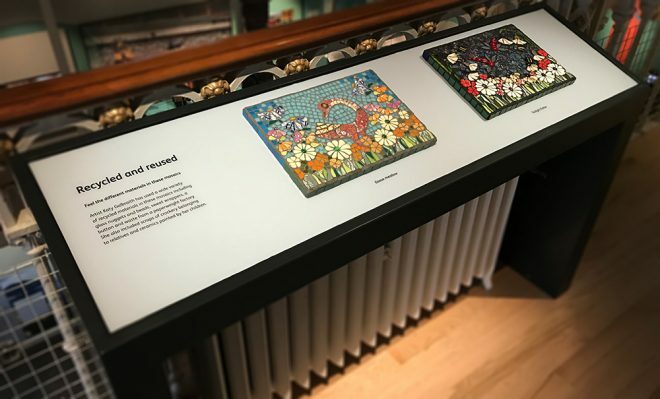 For this theme, we commissioned Scottish artist Katy Galbraith to make two mosaics using a variety of recycled materials including ceramics, broken car windows, glass, sweet wrappers and waste from a paperweight factory. She also included scraps of crockery belonging to relatives and ceramics painted by her children. For ‘Goose Meadow’ Katy was inspired by a goose figure carved on one of the Pictish symbol stones that we have on display in our Scottish History galleries. The different surfaces created in these mosaics are wonderful to touch and interesting to look at the way in which recycled materials can be made into new artworks. For this theme, we commissioned Edinburgh based resin jeweller Carla Edwards to make three pieces modelled on spherical motifs from a carved wooden panel from Java, Indonesia which is a new addition to the display in Inspired by Nature. 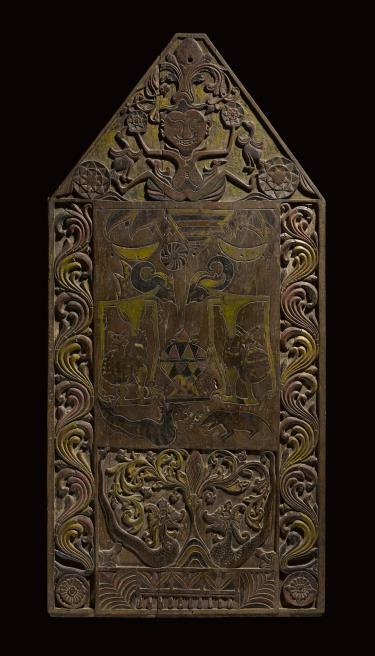 This panel would have been used to hang ceremonial kris knives on, but it also served a protective function and occupied a particular place within a house. The motifs Carla replicated are an eight-pointed star (octagram), a solar symbol and an open flower, which represent earthly and cosmic worlds. Carla made detailed silicon moulds which captured the surface relief of the wood and design of each motif. The pieces were then cast in resin and finished with a smooth but durable texture. Touching them enhances your sense of the carving and the ideas behind them. Most indigenous belief systems in Indonesia share the concept of a three-tiered cosmos comprising of an Upper, Middle and Under Worlds. This tripartite cosmology can also be seen in the composition of the carved wooden panel with its three distinct areas. A figure sits at the top with birds, which are associated with the Upper World, and a spherical motif held aloft in each hand. The central panel depicts a scene from the Hindu epic the Mahabharata involving the heroic figure Arjuna probably alongside Krishna. The lower section is carved with two nagas or snakes which are associated with the Under World. Animal figures can have a protective role in some cultures and are often used in pairs in architecture, such as on the gable ends of rooftops or displayed prominently either side of an entrance. For this theme, we commissioned Edinburgh based woodworker Sharon Kirby to make a scale replica of a crossed horse head gable, which is found on houses in Eastern Europe. She used an oak bargeboard and finished it with a satin varnish. Touch object by woodworker Sharon Kirby on display in the gallery. In contrast to the simple outline of the two-dimensional wooden horse head gable, which is designed to be seen from a distance, we sourced a pair of Chinese guardian lion-dog figures which are highly elaborate and tactile. Ancient guardian lion-dogs would have traditionally stood before Chinese Imperial palaces, tombs and temples.